What the blurb says: “Acting Detective Sergeant John O’Neill stands over the body of a dead teenager. The corpse was discovered on the building site of a luxury development overlooking the River Lagan. Kneecapped, then killed, the body bears the hallmarks of a punishment beating. But this is the new Northern Ireland – the Celtic Tiger purrs, the Troubles are over, the paramilitaries are gone. So who is the boy and who wanted him dead? 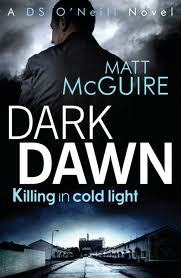 McGuire’s debut is slick and fast paced. A police procedural told from several point-of-views, it shows not only the world DS O’Neill inhabits, but also that of the old and new generations and the changing face and frictions within the crime world. The story grabbed me right from the opening chapter. O’Neill, a man with an unhappy past and a Chief Inspector out for his blood, is given the lead on a case which no one seems to care about, to solve the murder of a person who they can’t identify. With characteristic commitment to his job, O’Neill sets about solving the mystery, investigating leads that take him high into the political circles of the city and out into the criminal underworld, and in the process makes himself a target with a price on his head. The stories of two young upstarts in the drug world – Marty and Petesy – and Lynch, recently released from prison and trying not to get drawn into the underworld, add to the gritty setting and show the tension on the streets. The way the different point-of-view characters’ stories weave together is artfully done and sets up a cracking finale. Fast paced, and with plenty of twists and turns, I think this is a must-read for fans of police procedurals. Reblogged this on Murder in the First.